Father Paul Brandt, pastor of Blessed Teresa of Calcutta Parish, stands with Jason Kost (center), Neuman Scholar at the parish school in Limerick and Tom Reilley of the Connelly Foundation. Jason Kost, a student of Blessed Teresa of Calcutta School in Limerick, has been named a Neumann Scholar, the school announced this week. He is the first such awardee for the school. Kost will receive a four-year scholarship to the Catholic high school of his choice. 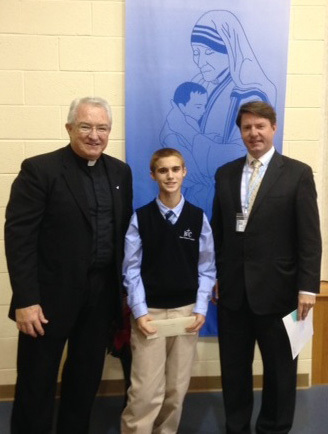 Across Montgomery County at Queen of Angels Regional Catholic School in Willow Grove, student Emmett Nama was also named a Neumann Scholar. Josephine Connelly of the Connelly Foundation, which awards the scholarships each year, presented the good news during a visit to the school Dec. 15.